Background and Purpose: Wood and wood processing industries are generators of a substantial amount of waste wood biomass, such as wood chips, shavings and sawdust. Such waste is often unused and its disposal can be a serious environmental problem. Different lignocellulosic waste materials have been successfully used as low-cost adsorbents (biosorbents) for the removal of synthetic dyes, as well as other contaminants, from wastewater. The aim of this study was to valorise the waste wood biomass of ten tree species, out of which seven are the most represented species of the Croatian growing stock, as biosorbents for the removal of synthetic dye methylene blue (MB) from model solutions. Materials and Methods: The waste wood biomasses (shavings or sawdust) of ten tree species, namely common beech, pedunculate oak, sessile oak, common hornbeam, narrow-leafed ash, poplar, European silver fir, Norway spruce, European larch and Douglas fir, were dried and milled prior to characterisation and adsorption experiments. Characterisation of the biosorbents was performed by chemical analysis and Fourier transform Fourier transform infrared spectroscopy (FTIR). Upon characterisation, batch adsorption experiments were conducted in order to survey waste wood biomass as potential adsorbents for the removal of synthetic dye MB. The colour removal was monitored spectrophotometrically at predetermined time intervals. Further adsorption experiments were performed using poplar sawdust. The effects of contact time, biosorbent concentration, initial dye concentration, and pH on the adsorption process were investigated. The experimental data obtained by batch adsorption experiments were analysed using adsorption isotherm models (Freundlich and Langmuir). Results: All the tested biosorbents were found to be very effective for the removal of MB from model dye solution, achieving high removal percentages ranging from 93.25 to 98.50%. Poplar sawdust proved to be the most effective. It was shown that MB adsorption process onto poplar sawdust could be interpreted in terms of Langmuir and Freundlich adsorption isotherm models. Conclusions: Taken together, these results suggest that waste wood biomass has the potential to be used as a low-cost biosorbent for MB removal from aqueous solutions. Wood is a natural renewable material that can have different purposes (e.g. construction material, fuel, etc.) and can be transformed into many different products. Depending on the geographical area, different tree species are prevalent in that specific area. The prevalent species of Croatian growing stock are the following: 36% common beech (Fagus sylvatica L.), 12% pedunculate oak (Quercus robur L.), 10% sessile oak (Quercus petraea (Matt.) Liebl. ), 9% common hornbeam (Carpinus betulus L.), 8% European silver fir (Abies alba Mill. ), 3% narrow-leafed ash (Fraxinus angustifolia Vahl) and 2% Norway spruce (Picea abies Karst.). All other tree species make up the remaining 20% . Apart from the use of wood as fuel, there are four major sectors in the EU forest-based industries: woodworking, furniture, pulp and paper manufacturing and converting, and printing . Since the industries that use forest wood are relatively heterogeneous, so are the resulting production waste streams. Wood processing residues (waste) remaining after processing logs and timber include bark, shavings, offcuts, sawdust, etc., and the amount of generated residues can be substantial. It can be converted into fuels in form of briquettes and pellets or can be used for the generation of electricity. Even though wood processing waste is available throughout the year and is relatively cheap, it often remains unutilised and its disposal can be a serious environmental problem. One of the possible uses of wood processing waste, besides its use as fuel, can be the use as low-cost adsorbents (biosorbents) for the removal of pollutants, such as synthetic dyes, from wastewater. Synthetic dyes are widely used in almost all industries, from textile to food industry. Since the excess dye left after the dyeing processes ends up in the industrial effluents, the dyes are recognised as the most common water pollutants that detrimentally affect the aquatic life . They also exhibit recalcitrance towards removal/biodegradation by conventional biological wastewater treatment methods. The method most often employed for the removal of dyes is adsorption using conventional adsorbents, such as activated carbon . However, despite their remarkable adsorption capacities, the application of conventional adsorbents is often limited by high price. It is, therefore, of great importance to find inexpensive (low-cost) adsorbents that could replace the costly conventional ones. By definition, the low-cost adsorbent is abundant in nature or is an industrial by-product or waste material that requires little or no processing . Lignocellulosic waste materials originating from wood and agri-food industry have the potential to be used as low-cost adsorbents, among which sawdust is one of the most appealing materials when it comes to removing dyes from wastewater . Sawdusts of different tree species were investigated as adsorbents for the removal of dyes: meranti wood for methylene blue removal , beech wood sawdust for direct brown removal , chir pine sawdust for Congo red and basic violet 1 removal , etc. The synthetic dye used as a model in this study is a cationic (basic) dye methylene blue (MB) (Figure 1), widely used for cotton, silk and leather dyeing , as well as in microbiology for staining and in medicine for the treatment of hypotension, hypoxia, as antimalarial and more . MB is not strongly hazardous, but it can still cause harmful effects in humans and animals. FIGURE 1. The chemical structure of methylene blue (MB). The overall purpose of this study was to valorise the waste wood biomass of ten tree species of the Croatian growing stock as biosorbents for the removal of dye MB from aqueous solution. Upon survey of ten tree species, the aim was to further investigate the most efficient species (i.e. poplar) regarding different conditions for the adsorption of MB, namely contact time, biosorbent concentration, initial dye concentration and solution pH. Waste wood biomass (wood shavings and sawdust) was kindly donated by Croatian Forests Ltd. Collected waste wood biomass included ten tree species, namely common beech, pedunculate oak, sessile oak, common hornbeam, narrow-leafed ash, poplar (Populus euroamericana Dode-Guinier), European silver fir (Abies alba Mill. ), Norway spruce, European larch (Larix decidua Mill.) and Douglas fir (Pseudotsuga menziesii Mirb.). The samples were oven dried at 323.15 K for 48 hours and ground using standard laboratory knife mill with 1 mm screen (MF10 basic, IKA Labortechnik, Germany) to ensure the particle size of adsorbent below 1 mm. No other chemical or physical treatments were applied prior to adsorption experiments. MB was purchased from Merck. A stock solution of 100 mg·dm-3 of dye was prepared daily, while the experimental solutions were obtained by diluting the stock solution to the desired dye concentration. The elemental composition (C, H, and N) was performed using a CHNS/O elemental analyzer Seria II (Perkin Elmer, USA). The determination of ash content and extractives was described elsewhere . The Kjeldahl method was used for protein content determination. Point of zero charge (pHpzc) was determined according to the method given in Burevska et al. . Crystalline cellulose content was determined according to Foster et al. . The surface functional groups affecting the adsorption process were detected by Fourier transform infrared (FTIR) spectrometer (Cary 630, Agilent Technologies, USA). The spectra were recorded from 4000 to 500 cm-1. where γe is the dye concentration at equilibrium, V is the dye solution volume (dm3) and m is the mass of the biosorbent used (g). 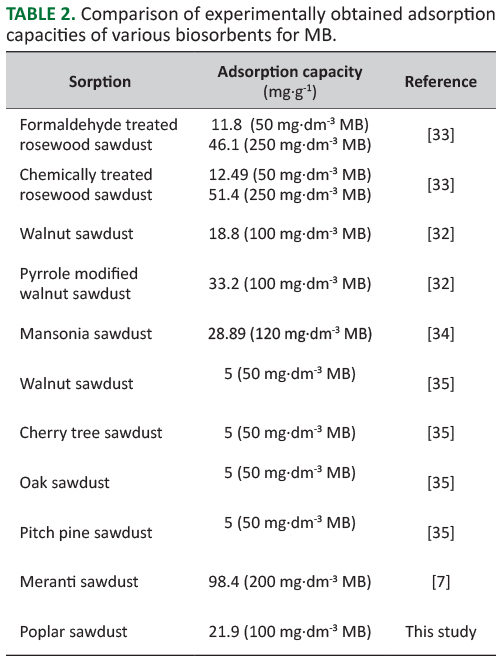 Based on the results of a survey of different tree species as biosorbents for MB removal, poplar sawdust was used in further adsorption experiments. The effect of biosorbent concentration and pH on the amount of adsorbed MB was tested for different biosorbent concentrations ranging from 2 to 10 g·dm-3. To study the effect of the initial dye concentration on the amount of adsorbed dye, the experiments were carried out at the temperature of 298.15 K, biosorbent concentration of 4 g·dm-3, 150 rpm and pH=7 for 120 min. The initial MB concentrations were as follows: 10, 30, 50 and 100 mg·dm-3. The effect of pH was tested in the pH range from 4.0 to 9.0, while all the other parameters were kept constant (initial dye concentration of 50 mg·dm-3, biosorbent concentration of 4 g·dm-3, 298.15 K, 150 rpm and 120 min). The pH was adjusted using 0.1 mol·dm-3 NaOH and 0.1 mol·dm-3 HCl solutions. The experimental data obtained by batch adsorption experiments were analysed using linear forms of Langmuir and Freundlich adsorption models. All the experiments were performed in duplicate and were found reproducible. The chemical composition of waste wood biomass of the surveyed tree species is given in Table 1. The results of the elemental analysis revealed that all used tree species have similar obtained C and H values ranging from 44.51 to 47.60% and 5.94 to 6.38%, respectively. This is in agreement with the research by Nacu  that reported similar values for total carbon and hydrogen. The chemical elements mentioned above, which are present in relatively large quantities, can form (along with oxygen and nitrogen) functional groups at the surface of sawdust that can serve as potential dye binding centres . The nitrogen content varied from 0.07 to 0.44%, while protein content varied from 0.24 to 1.06%. Wood is comprised of major chemical components which are cellulose (40-45%), hemicellulose (30%) and lignin (20-30%), while extractives, ash, proteins and other components make up the rest . The content of cellulose in this study was in the range from 31.66 to 44.27. Extractives include, amongst others, lipids, phenolic compounds, terpenoids, fatty acids, resin acids, steryl esters, sterol and waxes and their content generally varies between 2% and 5%, but can even reach 15% . In this study, the content of extractives ranged from 1.31 to 3.94%. Ash is the inorganic residue remaining after water and organic matter have been removed, which provides a measure of the total amount of minerals within a sample. The ash content of wood biomass can vary between tree species and tree components . High ash content can decrease the heating value of biomass . Abdolali et al. reported the average ash content of hardwood and softwood of less than 1%. However, in this study, the determined ash contents were higher and ranged from 0.81 to 1.9%. TABLE 1. The chemical composition of waste wood biomass. The surface chemistry of adsorbents is determined by the acidic or basic character of their surface, or in other words, the net charge of the adsorbent surface can play a crucial role in the interactions occurring during the adsorption process. The pH at which the adsorbent surface net charge is zero is defined as the point of zero charge (pHpzc). When solution pH is lower than pHpzc the adsorbent surface is positively charged and can interact with anions, while at pH higher than pHpzc the adsorbent surface is charged negatively and can interact with cations . The pHpzc of all used biosorbents was in the range from 5.25 to 7.10. In order to investigate the functional groups present at the surface of used waste wood biomass, FTIR spectra were recorded for all samples. The spectrum for poplar sawdust, as a representative spectrum, is presented in Figure 2. As already mentioned, high contents of lignocellulosic polymers (i.e. cellulose, hemicellulose and lignin) are mostly responsible for a large number of hydroxyl groups available as binding sites for cationic dye molecules, such as MB. Hydroxyl groups, among others, are those mainly engaged in adsorption processes [21, 23]. The FTIR spectrum of poplar sawdust is dominated by the broad band at 3332 cm-1 representing hydroxyl groups. It can be ascribed to –OH stretching vibrations of polymers, e.g. cellulose and lignin, and it indicates free hydroxyl groups at the surface of the adsorbent. The band at 2899 cm-1 indicates the presence of –CH2 aliphatic groups stretching. At 2102 cm-1 there is a band that can be assigned to –NH stretching. The bands from 1505 to 1423 cm-1 indicate the presence of branched-chain aromatic radicals . The intense band at 1028 cm-1 is probably representing the polysaccharides, i.e. it could be ascribed to C-O, C=C and C-C-O stretching in cellulose, hemicellulose and lignin . FIGURE 2. 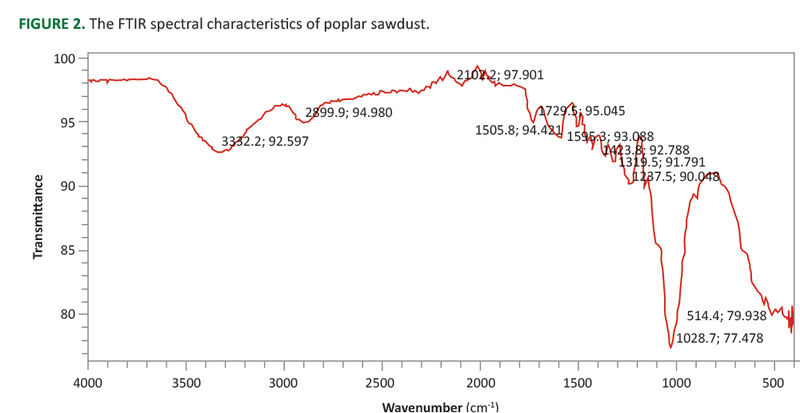 The FTIR spectral characteristics of poplar sawdust. The results of a survey of the waste wood biomass of different tree species used as biosorbents for adsorptive MB removal are presented in Figure 3. The concentration of dye (50 mg·dm-3) was selected based on the dye concentrations previously reported in textile effluents that ranged from 10 to 50 mg·dm-3 [26, 27]. The results clearly show that all used biosorbents showed remarkable adsorptive capability for MB with high levels of dye removal (over 90% in all runs) under the applied experimental conditions. The initial stages of the adsorption process (first 30 min) were characterised by the higher MB removal rates, compared to later stages when the removal rate becomes slower (data not shown). This can probably be explained by the larger unoccupied surface area available for dye adsorption at the earlier stages of the experiment . Similar results were reported for MB removal using different waste lignocellulosic material [25, 29]. FIGURE 3. Adsorptive MB removal using different waste wood biomass as biosorbents (γdye=50 mg·dm-3, t=120 min, T=298.15 K, γbiosorbent=10 g·dm-3, 150 rpm). The adsorption process is usually strongly influenced by the adsorbent concentration because higher adsorbent concentration ensures higher surface area available for adsorption. The effect of adsorbent concentration on the adsorption of MB onto poplar sawdust is given in Figure 4. The results show that the percentage of MB removal increased from 62 to 97% with an increase of biosorbent concentration from 2 to 10 g·dm-3. However, after the biosorbent concentration of 4 g·dm-3, the percentage removal remained almost constant over the biosorbent range of 6-10 g·dm-3, i.e. the further increase of biosorbent concentration did not markedly affect the adsorptive capacity. A similar behaviour was reported for MB removal using meranti sawdust as biosorbent . FIGURE 4. The effect of biosorbent concentration on the adsorption of MB onto poplar sawdust (γdye=50 mg·dm-3, t=120 min, T=298.15 K, pH=7, 150 rpm). 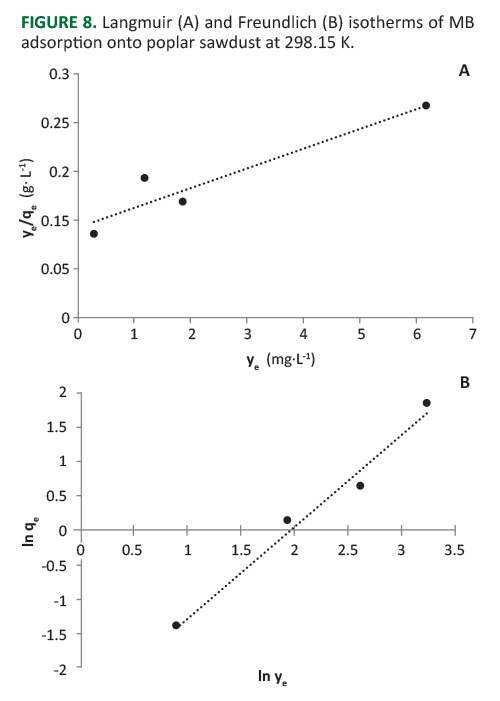 The effect of contact time on MB adsorption is given in Figure 5. As already mentioned, the MB removal is rapid during the first stages and then gradually slows down until the equilibrium is reached. The equilibrium was achieved within 90 min and did not change with further contact time increase. FIGURE 5. 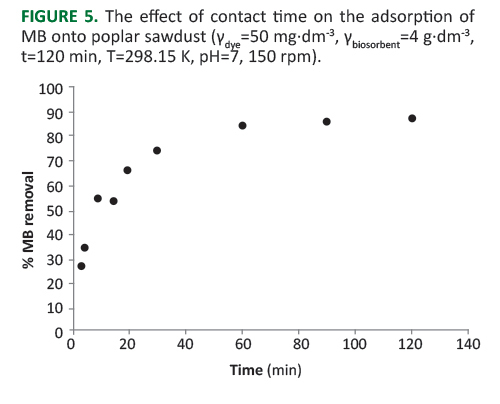 The effect of contact time on the adsorption of MB onto poplar sawdust (γdye=50 mg·dm-3, γbiosorbent=4 g·dm-3, t=120 min, T=298.15 K, pH=7, 150 rpm). 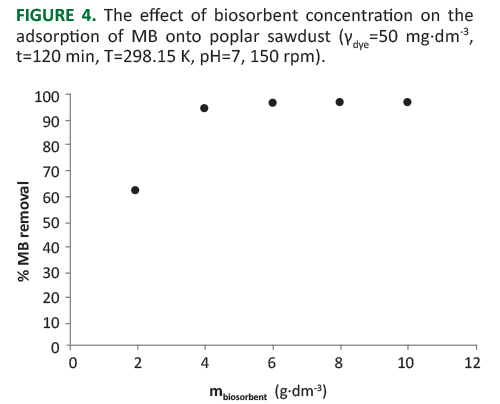 Figure 6 shows the effect of the initial MB concentration on MB adsorption onto poplar sawdust. FIGURE 6. 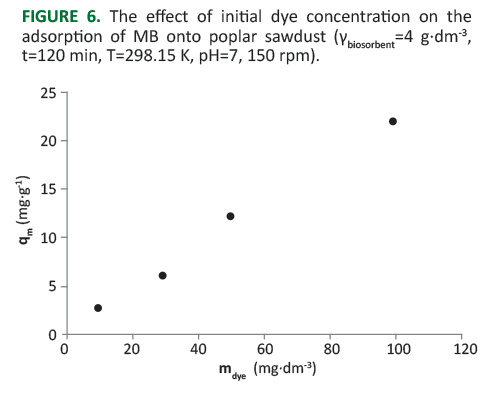 The effect of initial dye concentration on the adsorption of MB onto poplar sawdust (γbiosorbent=4 g·dm-3, t=120 min, T=298.15 K, pH=7, 150 rpm). The amount of MB removed at equilibrium increased from 2.41 to 21.90 mg·g-1 when the initial MB concentration increased from 10 to 100 mg·dm-3, which indicates that MB removal using poplar sawdust as biosorbent is concentration-dependent. This is in agreement with other studies using different waste lignocellulosic biosorbents, such as meranti sawdust , walnut sawdust  and modified Indian Rosewood sawdust . Furthermore, the experimentally obtained adsorption capacities in this study are comparable to those reported by other authors, which can be seen from Table 2. TABLE 2. Comparison of experimentally obtained adsorption capacities of various biosorbents for MB. One of the important parameters affecting the adsorptive removal of different contaminants from aqueous solutions (e.g. the complex matrix such as wastewater) is pH. 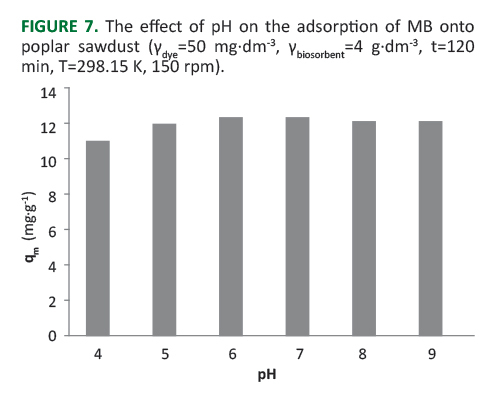 The effect of pH on the amount of MB adsorbed onto poplar sawdust at equilibrium was studied over the pH range from 4 to 9 and the results are presented in Figure 7. FIGURE 7. The effect of pH on the adsorption of MB onto poplar sawdust (γdye=50 mg·dm-3, γbiosorbent=4 g·dm-3, t=120 min, T=298.15 K, 150 rpm). The results show that the minimal amount of MB adsorbed was at pH=4, that it increased with pH and remained almost constant over the pH range of 7-9. Similar trends have been reported by other studies of MB removal using lignocellulosic materials [25, 34, 35]. The unfavourable effect of low pH on MB removal can probably be attributed to the presence of positively charged H+ ions that compete with MB cations for adsorption sites. Furthermore, pHpzc of poplar sawdust was found to be 7.1, so at pH higher than 7.1 its surface will be charged negatively and interact more readily with cationic dye MB. The adsorption isotherms describe the distribution of the adsorbate between the liquid and solid phase at the adsorption equilibrium at a constant temperature. They also offer insight into the adsorption capacity of the adsorbent for the removal of adsorbate from an aqueous solution. In this study, linear forms of Langmuir and Freundlich isotherm models were used to quantify the adsorption capacity of poplar sawdust. where γ0 (mg·dm-3) is the highest initial dye concentration. TABLE 3. Isotherm parameters for the removal of MB by poplar sawdust at 298.15 K.
FIGURE 8. Langmuir (A) and Freundlich (B) isotherms of MB adsorption onto poplar sawdust at 298.15 K.
The RL value in this study was 0.045, confirming that MB adsorption onto poplar sawdust under the studied conditions was a favourable process. When experimentally obtained qm_exp values were compared to the qm_cal values calculated based on the given Langmuir equation, a discrepancy could be seen. However, as already mentioned, experimentally obtained adsorption capacities (qm_exp) in this study are comparable to those reported by other authors (Table 2). where qe (mg·g-1) is the amount of dye adsorbed at equilibrium and γe (mg·dm-3) is the equilibrium concentration of dye in the solution. Freundlich isotherm constants KF and n indicate the adsorption capacity (KF) and whether the adsorption process is favourable or not (n). The Freundlich constants are given in Table 3. The values of n indicate that the adsorption is linear when n=1, n<1 indicates that adsorption is a chemical process, while n>1 indicates favourable adsorption that is a physical process . 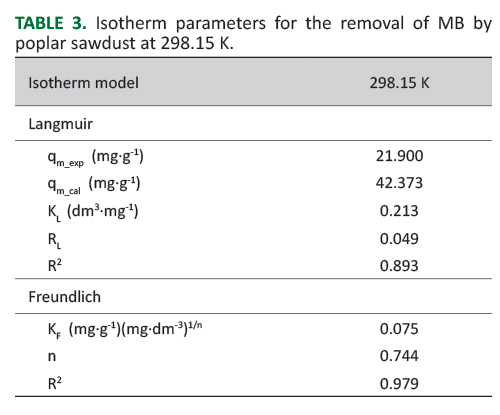 The results given in Figure 8B and Table 3 indicate that the adsorption of MB onto poplar sawdust is favourable and can be described in terms of the Freundlich isotherm model. Waste wood biomass of ten tree species used in this study proved to be effective for the removal of synthetic dye methylene blue (MB) from an aqueous solution, achieving high removal percentage ranging from 93.25 to 98.50%. Poplar sawdust, the most effective of all tested tree species, was used in further adsorption experiments. The results showed that the percentage of dye removal increased with the increase of biosorbent concentration and contact time. The amount of MB removed at equilibrium increased from 2.41 to 21.90 mg·g-1 with the increase of initial dye concentration (10-100 mg·dm-3). The effect of pH was investigated over the pH range from 4 to 9, whereas the minimal amount of MB adsorbed was at pH=4. After that, it increased up to pH=6 and then remained constant. The obtained equilibrium data were fitted to Langmuir and Freundlich isotherm models, and it was shown that the MB adsorption process could be interpreted in terms of both adsorption isotherms. However, the equilibrium data seem to be somewhat better fitted with the Freundlich isotherm equation. The overall results suggest that waste wood biomass represents a low-cost lignocellulosic adsorbent that has a potential to be used as an alternative to costly conventional adsorbents. However, further research should be undertaken to investigate the possibility of adsorption capacity improvement by different modification techniques, as well as the MB removal from synthetic and real wastewater samples. The authors would like to thank Croatian Forests Ltd. for the kind donation of waste wood biomass.